Windmill Engineering offers an expert windmill head replacement service. 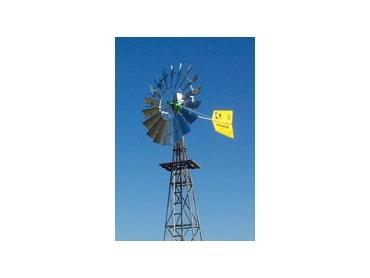 Wind is one of the cheapest, cleanest and most efficient and abundant energy sources available in Australia and Windmill Engineering can help farmers to harness this energy with its expertise in recycling, repairing and reinstalling existing windmills. With more than 40 years experience in the windmill building and maintenance industry Windmill Engineering’s John White advises that many old and disused windmills can be easily rejuvenated with the addition of a new head. Windmill engineering helps farmers to make the best use of old windmills simply left standing, unused in paddocks. Many windmills still have a perfectly sound tower structure, so rather than the expense of purchasing a whole new windmill it is cheaper and easier to have a new head expertly installed. One example is this 10 foot Yellowtail windmill which was fitted to an existing Comet pumping tower. The windmill now provides a reliable source of water for its many acres form a nearby spring. Contact Windmill Engineering for more information on rejuvenating existing windmills in the most cost efficient and appropriate manner.